Proto Libro celebrates its fourth anniversary this month! As I look back on the news and reviews I have covered, I feel like authors who are publishing later in life are getting featured on blogs and in the mainstream media more than they used to. Bloom is a blog that only publishes articles about debut authors over 40. 35 over 35 is a blog that started last year, and features a yearly round up of authors publishing debuts after 35. And I also see more traditional media outlets featuring older authors, making an older person’s debut a story to follow. The latest in this trend is in Poets & Writers magazine, which this month is publishing excerpts from five authors who debuted after 50. All of the authors were new to me and are mainly published in small presses. They feature a novelist, a poet, two short story writers and a memoir writer. The memoir, Rust Belt Boy, Stories of an American Childhood, by Paul Hertneky stood out to me the most. This is likely because my family comes from the Rust Belt, and the economic decline of this area feels so relevant to the political debates consuming our country. The book, which I have not read yet, is about Hertneky’s childhood in Western Pennsylvania and how the small town he grew up transformed at the end of the 20th Century as the Steel Mill era came to an end. I have put that one on my to-read list. Happy reading all and thanks for your ongoing support of Proto Libro! This is the most suspenseful love story I have ever read! In the late 1970s, in Boston, Lucy and Matt are set up by a mutual friend. Lucy is trying to get over Griffin, a man unable to commit, and Matt is just willing to go on a date. Although they come from different backgrounds, Matt is a cop who grew up in small town Pennsylvania, and Lucy is a recent college grad with an admin job at Harvard, who comes from a wealthy Connecticut family, they fall in love, and eventually marry after Lucy gets pregnant. But their love is never equal and this creates complications. Told in alternating chapters the book explores both sides of their love story and the pain of having children with someone who does not turn out to be the partner you wished they would become. The book opens with Lucy in the 1990s, and she is living alone, establishing in the first pages that Lucy and Matt’s marriage ends. Thomson builds suspense around the how and why, skillfully twisting and turning the story, until he lands on what I found to be a satisfying and realistic note. This is a family drama—a story of love and betrayal. And because the book is set up to explore how their love ends, the story is infused with suspense not often found in love stories. Thomson lives in Boston with his family. He is publishing this debut in his 60s–another example that there is room for older debut novelists–and did not publish his first short story until he was forty. I received an e-copy of this book from the publisher via NetGalley. Jinx, a woman in her early thirties, is living alone in the East London home she grew up in with her mother, when Lemon, a friend of her mother’s, unexpectedly knocks on the door. It has been 14 years since Jinx’s mother was murdered, and 14 years since Jinx has seen Lemon. Jinx invites Lemon in and they begin a three-day remembrance of the turbulent time leading up to her mother’s murder, when Jinx’s mother fell in love with Berris, Lemon’s oldest friend. This is a powerful story. The chapters seamlessly glide between the present visit with Lemon, and Jinx’s teen years when Berris and Lemon came into her life. There is also a brief scene with Jinx’s ex-husband, Red, and her estranged son, Ben. Jinx, the daughter of a Montserratian mother and Jamaican father, who died when she was quite young, had an unremarkable childhood until her mother fell in love with, Berris. Berris literally changed the course of her and her mother’s lives, and through her conversations with Lemon, Jinx works through guilt, shame and anger around her mother’s death. Longlisted for the 2011 Man Booker prize, Edwards has not gotten a lot of press in the US. Nor did I find an author website. I read about this book in Poets and Writers magazine and learned more about Edwards from an interview in The Millions that was published in 2011 when she was longlisted for the Booker. 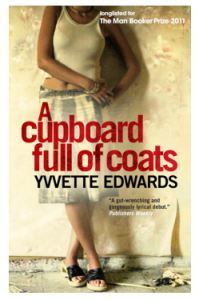 Although the woman on the jacket of the photo looks like she is in her late 20s, Edwards was 45 when A Cupboard Full of Coats came out in the UK. I found this book to be beautifully rendered and completely engrossing. It is a mother-daughter story with incredible depth. Edwards talks about how she came up with the story idea in on the Foyles website.